5541 Fheetlet 372 15 Fr. 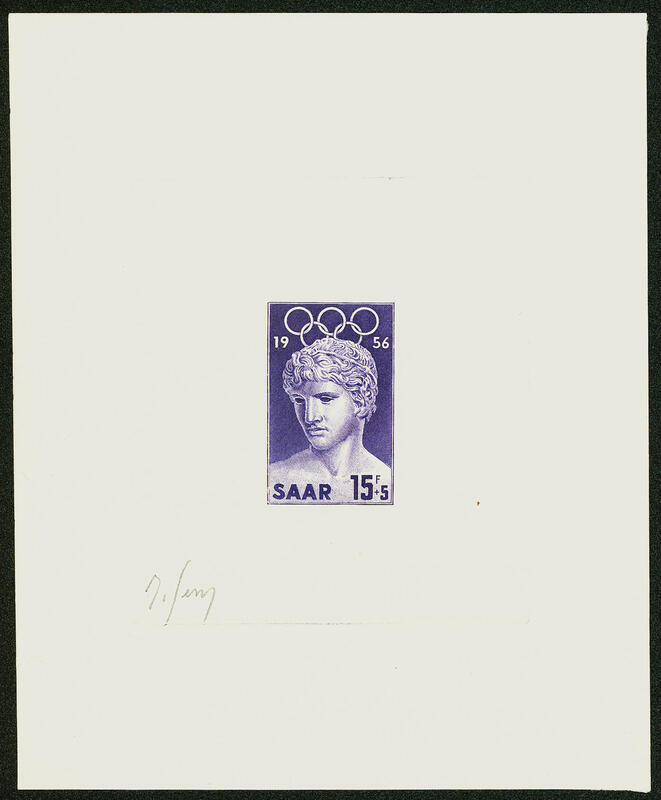 Olympic games 1956, faultless Artist block in pale violet with signatur of the artist \"SERRES\", extraordinarily rare! 5542 Fheetlet 372 15 Fr. 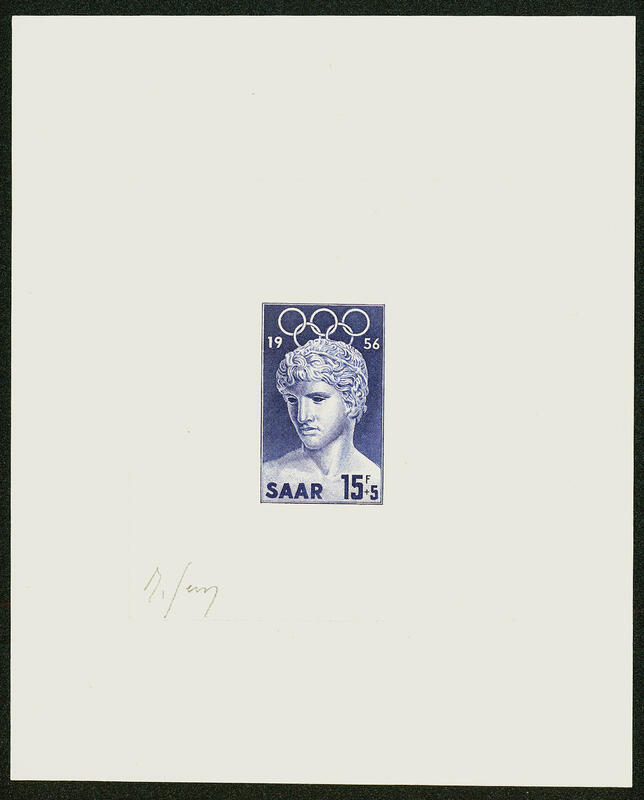 Olympic games 1956, faultless Artist block in blue-violet with signatur of the artist \"SERRES\", extraordinarily rare! 5543 Fheetlet 372 15 Fr. 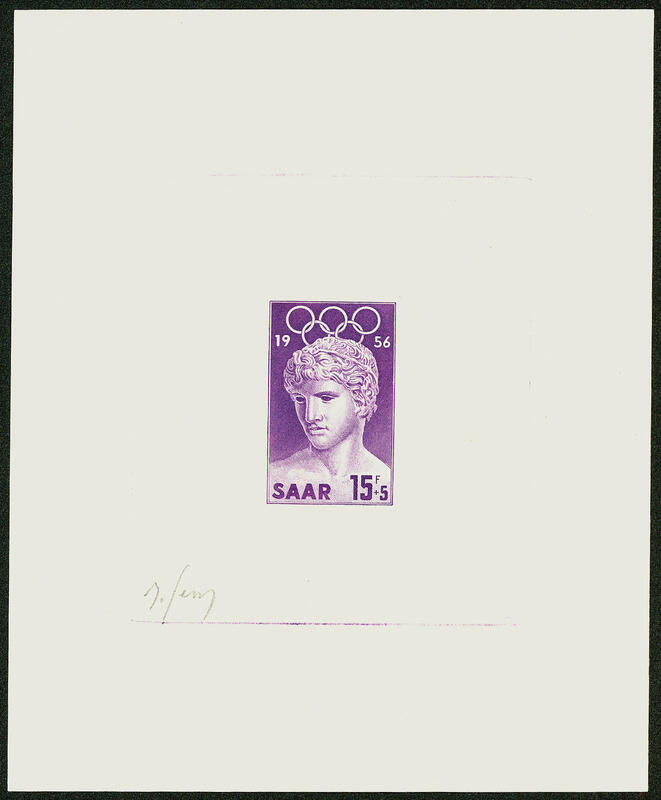 Olympic games 1956, faultless Artist block in violet with signatur of the artist \"SERRES\", extraordinarily rare! 5544 Fheetlet 372 15 Fr. 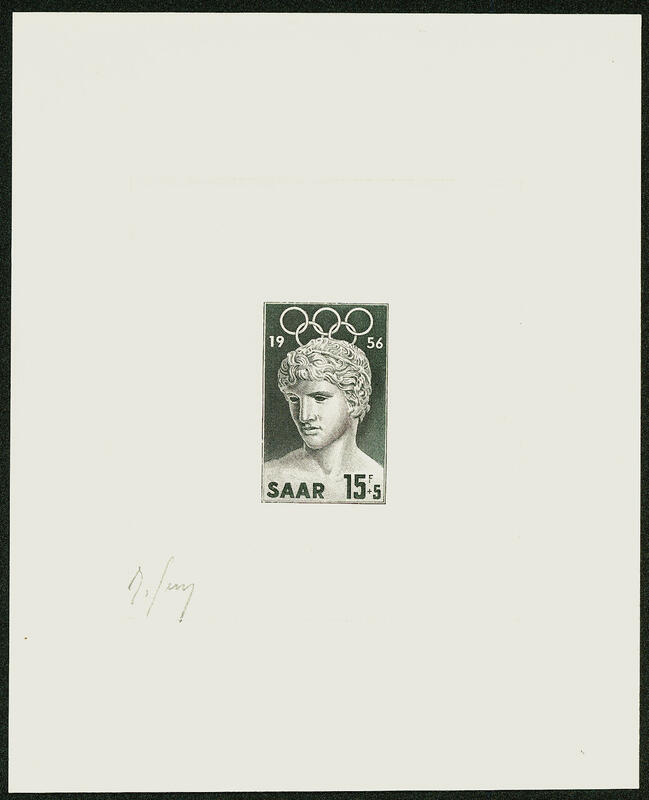 Olympic games 1956, faultless Artist block in black green with signatur of the artist \"SERRES\", extraordinarily rare! 5545 Fheetlet 372 15 Fr. 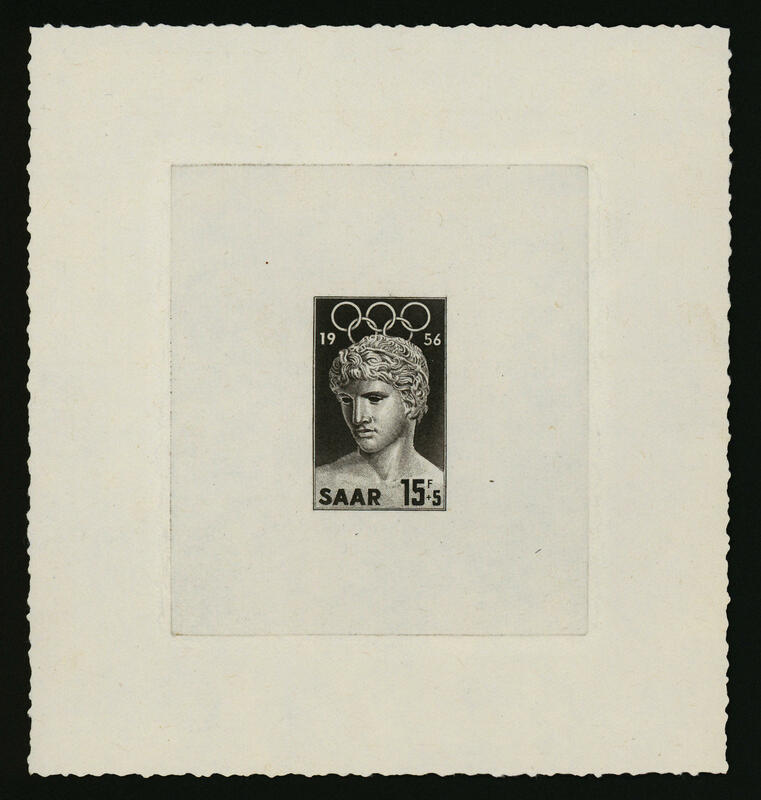 Olympic games 1956, extremely rare proof in Secretary of State souvenir sheet form, so-called \"Artist block\". There are only very few examples from this known! 5531 33/44Br Official stamps 1944, the complete set from the left lower corner of the sheet with dates of printing, fresh colors and in perfect condition mint never hinged (partly hinge traces only in the margin of sheet). Rare in this form! Michel 590,- €. 5392 ✉ \"P. 55. 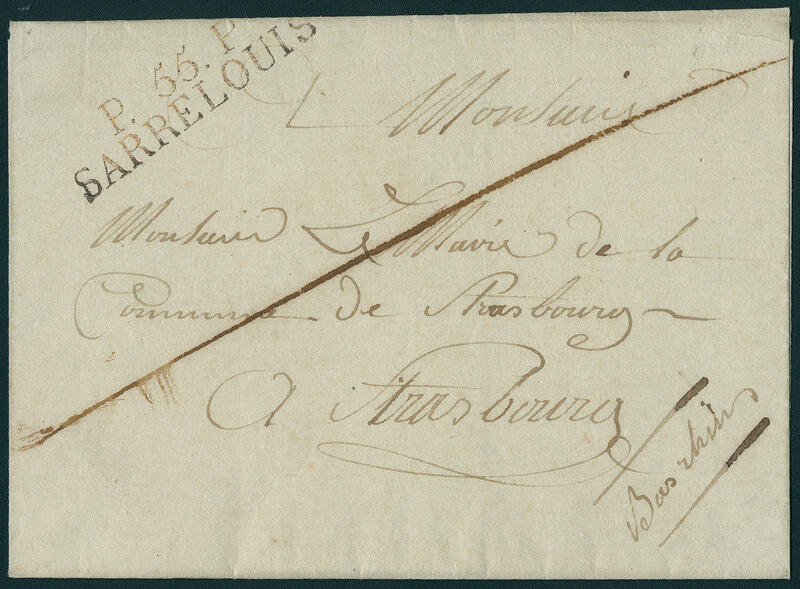 P. SARRELOUIS\", the scarce two line cancel in red black, razor-sharp on very nice folded letter cover to Strasbourg with on the back rating note. A cancellation rarity in outstanding quality! (Saar handbook no. 16). 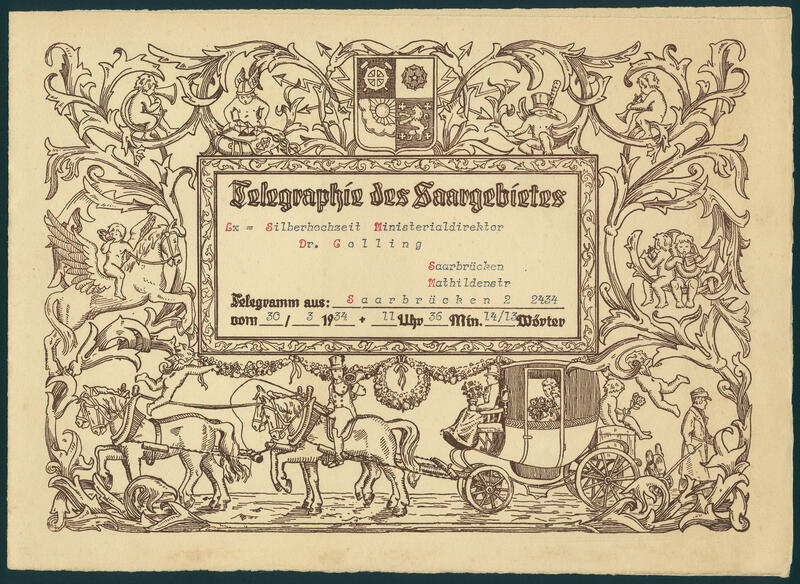 5547 telegram \"Telegraphy of the Saar region\", very nice decorative sheet telegram with on face stamp \"SAARBRÜCKEN telegraphs office 13.1.35\" in outstanding condition. 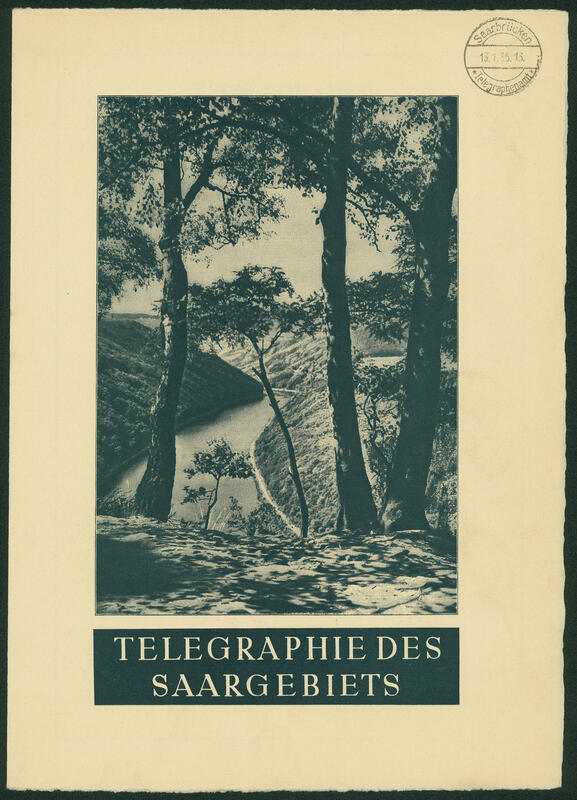 Such ornamental blank telegrams the Old Saar period are general very rare! 5548 telegram Decorative sheet telegram with coach, shipment to the silver wedding from head of department Dr. Golling Saarbrücken at the 30.3.34. Rare! 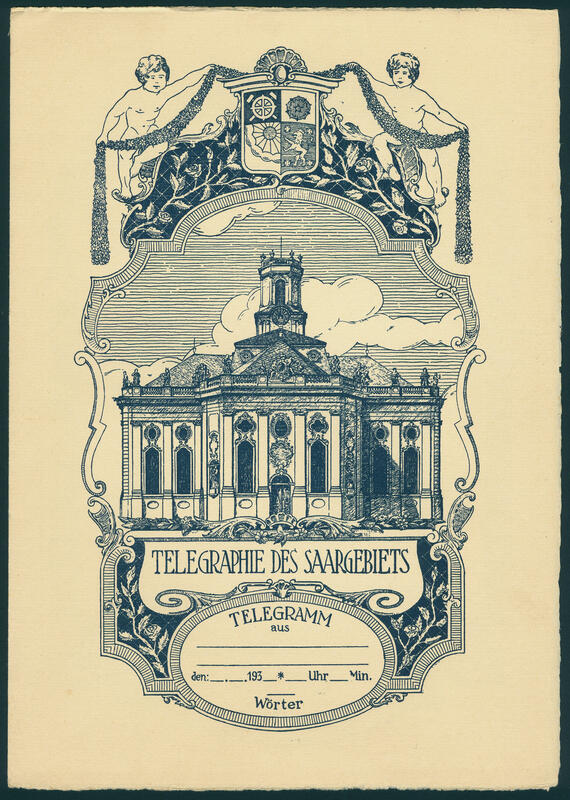 5549 telegram Decorative sheet telegram with illustration the Ludwig church in Saarbrücken in perfect condition, inside with postmark of the philatelic agency for stamps for collectors from \"BERLIN 16.9.37. \". Rare! 5550 telegram Decorative sheet telegram with illustration the Saar, clean used from \"SULZBACH 18.1.1933\" with Congratulations to the marriage. Rare! 5530 ✉ \"ST. INGBERT 27.8. (1872) \", semicircle cancel razor-sharp on postal stationery cover Bavaria 3 Kr. 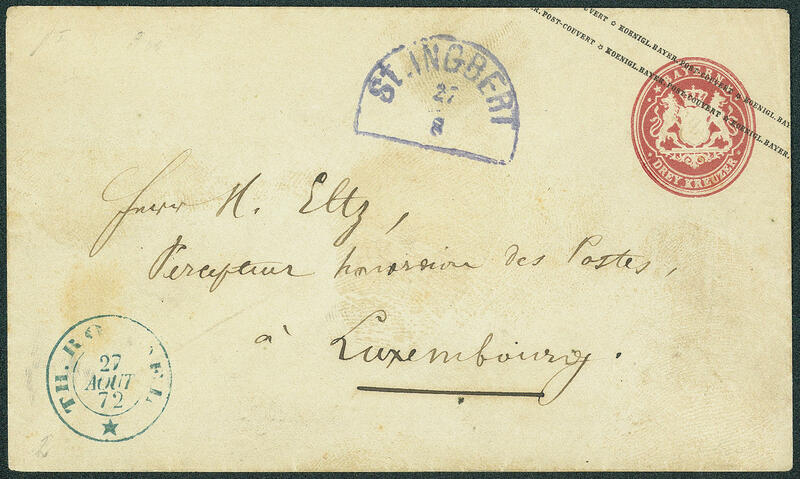 With Sender date stamp to Luxembourg with arrival postmark. 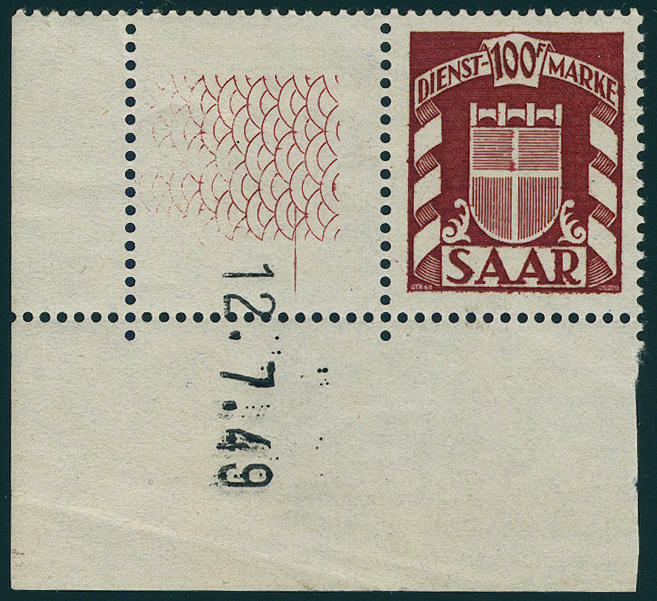 An extraordinary Saar document from the Bavarian time with scarce Boundary postage. There are very few documents of this kind have become known!